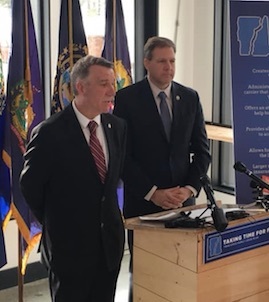 LITTLETON, N.H. — The governors of Vermont and New Hampshire announced a twin-state family leave plan that would offer benefits to 18,500 state employees and give private businesses the option to join in at a cost affordable to employees. Last year, the Vermont legislature tried and failed to pass a paid family leave program. Gov. Phil Scott vetoed the bill because it required new taxes to pay for the time-off related work benefits. But under the program introduced Wednesday at the Schilling Beer Co. in Littleton, Scott and New Hampshire Gov. Chris Sununu said the plan would be optional for private companies and require no new taxes on Vermonters. He added that the program would achieve many of the goals that Democrat and Progressive lawmakers put forth in the past legislative session. Gov. Phil Scott with New Hampshire Gov. Chris Sununu at the Schilling Beer Co. in Littleton, New Hampshire. Scott said offering an affordable paid leave program could help the state attract new Vermonters. Gov. Sununu echoed the sentiment that the plan will offer competitive rates without pushing mandates. “[We’re leveraging] the buying power of your base employee pool at a very low cost that provides the opportunity across the board for all the private sector employees, if they so choose to get on board,” he said. On the Vermont side there are a little over 8,000 state employees who would receive the benefit at a cost of about $2.4 million. When New Hampshire’s 10,500 state employees are added, the cost becomes affordable for the states and for employees of private companies. Which private insurance companies would run this program will be determined by a request for proposal process. The “premiums” would vary for private sector participation depending on how many employees within a given company choose to opt in. Companies with more than 20 employees and 100 percent participation will get better rates than those with fewer than 20 employees and partial participation. Jeff Cozzens, CEO, and co-founder of Schilling Beer, issued a statement explaining why he will support such a program for his employees. “As a small business along the New Hampshire-Vermont border, roughly half of our employees live in Vermont and half live in New Hampshire,” he said “This proposal has the potential to help all of our employees. Scott seemed to indicate that adopting the plan would require approval by both state legislatures. “If we’re successful in each of our state legislatures, we can establish a model and standard for the rest of the country that meets the calls for a greater work/life balance which is really so important to each and every one of our businesses,” he said. In New Hampshire, at least 16 insurance companies have expressed interest in administering the plan. The question now is will Vermont’s liberal lawmakers embrace the two-state plan or instead try to force passage of last year’s paid family leave plan using their new supermajority in the Legislature. House Speaker Mitzi Johnson, D-South Hero, has indicated skepticism that the pool of participants will be large enough using a voluntary opt-in system. The Dems will never let this fly. It’s not mandatory. They want to FORCE you to participate. They need to EXTRACT more money from your paycheck so they can sleep well at night. All those D.I.N.K.S (Dual income no kids) in VT are going to love this. they’ll get hit twice int he same family with no intention of EVER needing this. Only 402 more weeks until their 18th birthday, so what’s the plan? 12 weeks to raise a child isn’t enough time. Perhaps if we had housing ownership that was affordable, people could make their own plans. This benefit only gives those who don’t need it more money and those who truly need a better plan, false hope. It will solve nothing, it will not make families stronger, more financially sound, it will not bring love, joy and peace which families so desperately need. We’ve got 402 more weeks to cover, what is the Vermont’s plan? A family the basic building block of society often looks for the same thing when moving into any community. 4) Low Crime, Low Drug Problem. Provide these things and you’ll have good, solid, grounded people flocking to our state. People with a solid foundation with a life based upon truths, will look at this favorably. I couldn’t find this anywhere in the 9,616 mi² of Vermont, so I had to move. Unfortunate, but true. Interesting to note the number of state employees in Vermont, 8000 and New Hampshire 10500. The GDP of VT is roughly 27 billion and NH it is roughly 69 billion. Do the math! NH does almost double the GDP per state employee as Vermont. But, I guess we new that, but still unfortunate that this is what our voters want! Are we REALLY expected to believe that this won’t turn into just another screw job to the taxpayer? These people have no respect for us. Seriously. They really believe we are that stupid. A $2.4 million a year cost for Vermont but no new taxes. Sounds like Bernie is Scott’s advisor. And why would the 2 states not self-insure this if it is even an acceptable idea? One thing is for sure: Some insurance company will benefit considerably from this.